We've Got Boxes for You! Don’t despair if you don’t have the packing materials you need at home. 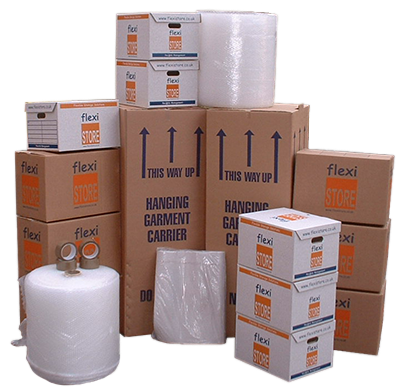 We have a selection of packing supplies, such as small, medium and large boxes, wardrobe and archive cartons, bubble wrap, packing tape and marker pens. We can even deliver these to your door if needed. Please scroll down for a table with more information about the packing products and the packing bundles we supply. To order our value packing kits and individual packaging products, please contact your nearest Flexistore. Read the article below to make sure you have everything you need when packing for self storage. We also recommend you to check our packing tips before you start loading the vault. Packing for Storage - What do I Actually Need? Small Box 46x32x30cm £2.80 Strong, double walled carton. Medium Box 46x46x30cm £3.50 Strong, double walled carton. Large Box 46x46x61cm £4.10 Strong, double walled carton. Archive Carton 40x30x26cm £2.80 One piece assembly with integral lid. Wardrobe Carton 51x46x124cm £15 Box comes with hanging rail for clothes. Bubble Wrap 5m/100m £3.60/£56 Sold in 5m lengths, one full roll measures 100m. Packing Tape 1 roll £2.80 1 roll is 5cm wide and 66m long. We also offer value packing bundles in different sizes that will save you 20%. You can order over the phone or by getting in touch with us here.